Product prices and availability are accurate as of 2019-04-13 09:18:24 EDT and are subject to change. Any price and availability information displayed on http://www.amazon.com/ at the time of purchase will apply to the purchase of this product. Water tank capacity: 90ml max. a- Warm Up: Before you use the Miniespresso coffee maker, please preheat the machine and clean up all tools. With warming up, please direct using the hot water without coffee. b- Hot Water Temperature: The best hot water temperature is 90±3?. After Warming up , the coffee is 70?. c- Ground Coffee: 7-8g, Please use a spoon at the bottom of the pressure. 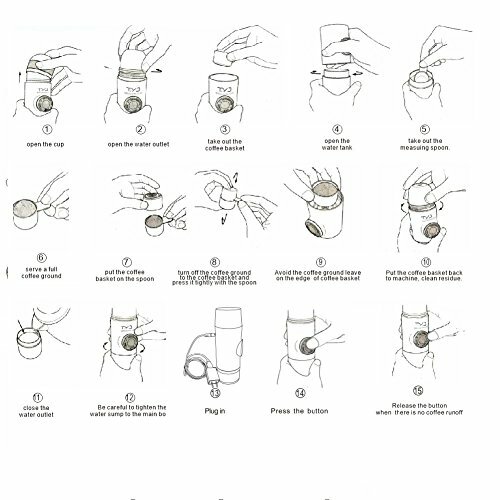 d- Water Pump: With ground coffee powder spoon please do not put inside water cup, avoid coffee powder through the water hole plugging water pump.If you plug in, please clean up with water several times. e- Water Calibration: When using, please don't exceed the maximum scale line to avoid leakage. f- Operation?Using press button 30-40S. Discontinuous operation machine may occur not interrupt operation extraction, such as in this case, simply unscrewing outlet deflated, can cause the machine to work. g- Washing:The fuselage with motor and the circuit board, pay attention to not flooded. The rest of the parts can be directly flush, the suggestion with a soft cloth to wipe clean and dry. 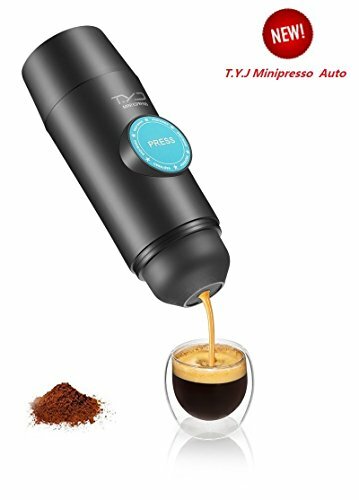 Take T.Y.J Miniespresso with you, enjoy a great cup of coffee , set your own special tone for the whole day. 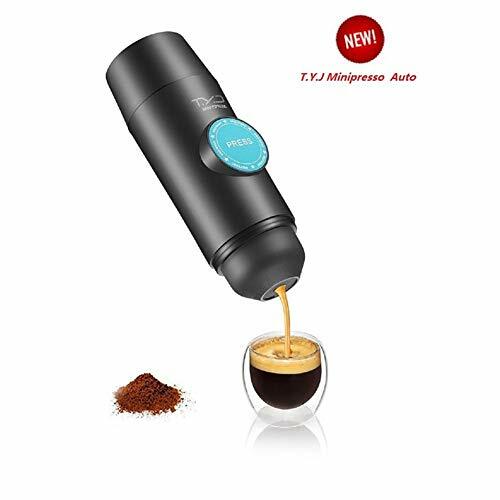 Provide you with espresso anytime anywhere --Small and lightweight, great engineering and ingenuity, this mini espresso maker is the symbol of your wonderful life style. Take it with you, enjoy the freshly brewed coffee anytime anywhere. 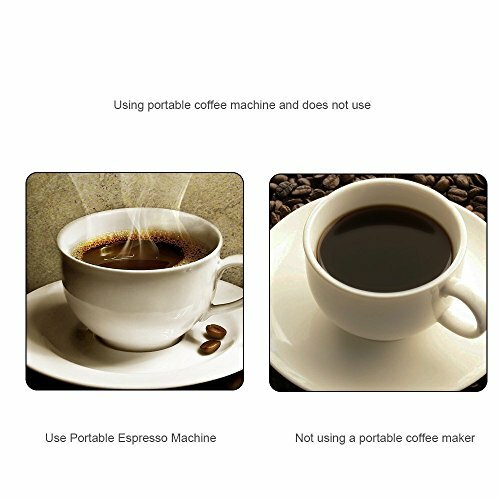 High Quality Espresso Coffee Maker --With pump pressure up to 15 bar, the portable coffee maker can brew a shot with strong aroma. Besides Espresso, this mini portable machine also has the function of making quick cold brew coffee. Easy to use --Put a scoop of ground coffee powder into the coffee basket?add hot water into the water tank?plug in power?press the button?now enjoy the delicious espresso. Regular cleaning --Wash the scattered parts such as coffee basket, water tank by water directly. Clean the main body with soft and dry cloth and keep it away from water. No other special maintenance. MODERN DESIGN --Simple and fashion design, classic black and blue, perfect designed for a better life.